Several years ago, there I was, one of many lifelong fans of Walt Disney's Haunted Mansion attraction, wondering how someone such as myself could celebrate its creation besides simply perusing my collection of related merchandise or by partaking in an occasional visit to the attraction. As quickly as many Mansion fans asked that very same question, we were given an answer; the Happy Haunts Ball (and Events) at Disney World's Haunted Mansion. Were our hopes realized? Did we partake in a chilling celebration? The answer varies, but one thing is certain. This Haunted Mansion finally got festivities honoring it that it had long since deserved. In 2002, Disney honored the perpetual house of 999 happy haunts with the first gathering. Guests were treated to presentations on the attraction that took them through its history, a hint at the upcoming movie and book to come out in 2003, dinner in Liberty Square and Frontierland, an evening of riding the Haunted Mansion (and other attractions in the area), a treat worthy of Shakespearean prose and a parting gift. Not bad for the first year. Ahead is a pretty detailed account of the goings-on for the 2003 festivities. Many thanks to several fellow Mansion fans who filled me in on the Phineas activities, as well as anything I missed. In 2003, Mansion fans were offered the chance to attend the 2nd Annual 999 Happy Haunts Events at Walt Disney World. We had not one, but THREE packages to choose from that were given the popularized nicknames of the legendary Hitchhiking Ghosts Phineas, Gus, and Ezra. The events, based upon the package and price, began Monday, October 27th, and concluded on Wednesday, October 29th. The Phineas package included events for all days noted, Gus included Tuesday and Wednesday, and Ezra included Wednesday afternoon and evening. Most of the entertainment was held at the Coronado Springs Resort's convention center, with the main festivities taking place at the Magic Kingdom on the last evening. Registration was held in a Coronado Springs convention center check-in area and ballroom on Monday and Tuesday. Participants signed in and received their event badges, which noted the group they were in via the picture of a Hitchhiking Ghost and name. In the ballroom, merchandise purchased after the first random selection process, as well as the "Parting Gift" was handed out and quality checked by Event Services assistants and event guests. After picking up items purchased, everyone could join in on a dig for free, limited edition pins, and have an event photograph taken. Lastly, they could catch a sneak preview of the Haunted Mansion collectibles (including film props) that were to be auctioned off Wednesday evening. A few of the items included in the auction were prototypes of the event pin, a copy of the exclusive (not publicly available) book The Art of the Haunted Mansion signed by Rob Minkoff and Don Hahn, and a shadowbox rendering of the Walt Disney World Haunted Mansion and graveyard by artist Dave Avanzino. Partakers of the Phineas package prepared for a night of extravagance and adventure at the Haunted Mansion on Monday. When participants met up that evening in the conference center of the Grand Floridian, they were offered the chance to be made up as corpses by a trio of face painters. It was an assembly line job: one would airbrush a grayish foundation, another would airbrush in skull shadows with a darker hue and the third would brush paint wrinkles and worry lines. If interested, various costumes could complete each person's look. White limos (alas, no liquor or blo pops) ferried them to the Magic Kingdom, dropping everyone off at Liberty Square. From there, a riverboat launch and beverage reception took place. The Haunted Mansion seemed particularly striking that night, especially across the waters of the river and against the unusually quiet evening. It was just the Mansion, the foyer bells playing across the water and the awed hush of those in attendance. Following the tale of Sleepy Hollow told by the town crier, guests walked up to the Mansion for dinner. Dining took place in the two Stretching Rooms and the Foyer of the Mansion, with a few Imagineers peppered amongst the tables, deftly cloaked in their costumes and face paint to blend in with fellow guests. Diners started off with spooky lobster bisque served in a carved mini pumpkin, followed by a marinated breast of pheasant with wild greens. To cleanse their palates before the next course, each savored blood orange sorbet served in glowing ice skulls. Mushroom stuffed tenderloin of beef, herb crusted swordfish, and vegetables aplenty comprised the main course. Chocolate tombstones with raspberry sauce concluded their feast. After the meal, the group went on a ride-through of the attraction, and then walked back up to the front gates where the limos took them back to the Grand Floridian. Upon returning to their rooms they found Madame Leota charger plates (from dinner) created by artist Elisabete Gomes, along with personalized tombstones, each boxed up neatly for their return to the living world. Lunch the following day took place at the posh Victoria and Albert's restaurant in the Magic Kingdom. From the Maine lobster to porcini crusted poussin (poultry), roasted pumpkin bisque to beef tenderloin with braised short ribs, concluded with chocolate mouse with strawberries and a vanilla bean crème brulee, Phineas folk experienced extraordinary cuisine twice over during their events, with more to come. The first official Gus event started Tuesday evening. Participants gathered at one of the convention center's larger ballrooms with badge in hand, entering a room adorned with low lighting, rolling fog, and ghoulish flair. Plants, gargoyle statues, and a large wrought iron fence and gate sectioned off the front third of the room, dubbed the "Ghostly Reception" area. Mini bars bordered the far walls to quench thirsty revelers. Waiters, dressed as zombies, silently offered an assortment of hors d'oeuvres to the crowd as a band played before the façade of a gloomy old house. Threading their way through the crowd were several character actors, interacting with whomever they bumped into. 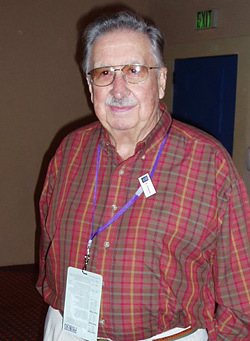 After snacking on finger foods and engaging in conversation with the likes of famed Imagineer X Atencio (pictured at the event, left) and fellow Haunted Mansion fans en masse, the gate opened, and the group was led into the larger area of the ballroom for the "Gravediggers Ball Dinner". Several dozen tables festooned with ominous décor awaited guests eager to partake in an evening of dining. On each table, spider webs, rose petals and eyeballs wove around a centerpiece of Hitchhiking Ghost bobbleheads, encircled by a wreath. Glow-in-the-dark insects, spiders and scorpions were strewn around the tables, making a bug fight amongst neighbors nearly impossible to resist. Surrounding the dining area were various props and pieces of a ghastly nature, from guillotines and skeletons to mausoleums and caskets. At the edge of the room laid a stage with a large canvas and skulls stacked upon each other on either side, flanked by a set-up of a haunted cemetery. Above this was a windowed balcony from which a trio of Hitchhiking Ghosts bedecked in glowing blue garb sang songs every twenty minutes or so. Guests of each reserved table were greeted once again by undead waiters who served up a three-course meal. The first course included rolls with "hidden Mickey" shaped butter, and a salad of mixed greens, pine nuts, and choice of dressing. White and red wines were offered at this point, along with an occasional "ugh" or grunt from the waiter in an effort to assist or capture attention. The second course consisted of a chicken breast, glazed fish fillet, rice, and assorted vegetables. The third course, brought out before the main entertainment, was a decadent chocolate cherry cheesecake. darnitall). As everyone exited the dining and reception areas, they came upon tables with piles of boxes, and event staff eager to hand them out. Each box contained two steel goblets with a pewter finish, marked with the Happy Haunts Event logo. Wednesday morning beckoned Phineas and Gus guests back to the convention center to a "Raising the Dead" breakfast buffet. The ballroom from the night before was utilized (sans spooky decorations), and several long rows of tables provided food to nourish fans before heading to the morning's events. Around the corner from the breakfast, a long room filled with seats was set up for the two presentations. Headed up by Imagineer Jason "Jasmine" Surrell, the first consisted of an informal chat with X Atencio, Disney animator and Imagineer known for his work on the Haunted Mansion and Pirates of the Caribbean attractions, to name a few. He recalled his early days as an animator for Disney, and his foray into WED Enterprises (later named WDI) per a nudging from Walt himself. Following the discussion, a question and answer session commenced, insighting one fan to ask X Atencio a Disney company related question, and give a shameless plug to Doombuggies.com at the same time. The second presentation showcased the Haunted Mansion movie. Jason Surrell discussed some of the scenes the movie would have that tied to the ride. He also brought up ride and movie tidbits from his book The Haunted Mansion:: From the Magic Kingdom to the Movies and showed several clips on the movie's key players (producer, director, special effects, costumes, makeup). Jason then closed with a sneak peek of a scene from the movie, which he played twice for some of the giddier folks in the audience. The final experience marked for all event guests and noted as the Ezra event took place after the Magic Kingdom closed Wednesday evening to its regular visitors. Attendees ventured down Main Street and into Adventureland, taking in the themed lighting and projections (witches and Mickey bats) on various buildings, including Cinderella's Castle. Folks wandering to the furthest point between Liberty Square and Fantasyland could have a picture taken in the most coveted of places (in a doombuggy with a Haunted Mansion themed background added post-grin via computer). A Haunted Mansion movie emblem shone down near the entrance to the ride, giving many a chance for a great photo opportunity. Food was served on long, decorated tables outdoors across several stations between Liberty Square and Adventureland. Guests could partake of their meals outside (with or without ample helpings of bar-b-que sauce), or within several restaurants opened for the gala. Carved meat, chicken and fish, along with salads, mashed potatoes, and rice dishes were among the many items served. Beverages and desserts (petit fours and cake) were also available throughout the area, providing plenty of sugar and libations to all. The Haunted Mansion, of course, was open to any foolish mortal who dared to enter, along with Pirates of the Caribbean, Aladdin's Magic Carpet ride, and the Riverboat. A deejay booth was set up near the edge of Frontierland, blasting haunting club-style tunes for those who wanted to boogie down. Characters wandered through the event, regaling curious onlookers with stories of the Headless Horseman, or interacting with participants ("Is anyone dead yet?") as they strolled from ride to ride. Post-dinner at the Yankee Trader, an autograph line was set up for folks who didn't get a chance to have their merchandise signed earlier in the day. Several lucky parties were handed an exclusive Art of the Haunted Mansion book which was then signed by Jason Surrell. As the evening came to a close, the Headless Horsemen rode his way through the event proceedings, followed by dancing gravediggers and dearly departed couples dressed in their finest duds. Guests made their way to the back side of Liberty Square for their treat, which was a tombstone shaped shortbread cookie, sprinkled with sugar, and topped with a white chocolate event logo emblem. Walking past the castle and down Main Street, one could hear Little Leota and her famous spiel, coupled with the haunting sounds of a Grim Grinning Ghosts, asking guests to "hurry baaack." As everyone exited the Magic Kingdom, holding cookie and Haunted Mansion Movie bag (with red event cup) in hand, one could only hope to hurry back for an encore of the week. From the sound of it, 2004's events might be the "must do" bash for Mansion fans. I can hardly wait!